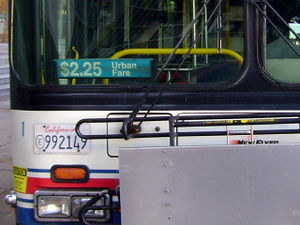 A small sign behind the windshield shows the fare for the bus route. MTS fares can be paid with cash (single ride), Compass cards (all fare types), or Compass Cloud 📱 app (pass only). Trolley one way tickets are valid for 2 hours and transfers between trolley lines are permitted. The same ticket does not apply when transferring to and from buses. All MTS passes require a Compass card, which (except discounted youth, senior, disabled, Medicare cards) can be obtained from MTS or NCTD ticket machines. MTS day and monthly passes are valid on NCTD Breeze and Sprinter. Regular passes are not valid on Premium Express and rural routes. MTS also offers multi-day pass good for consecutive days. Those passes are available only from San Diego Trolley ticket machines. 14-day pass, which costs $43, is available at Vons and other pass sales outlets. This page was last edited on 6 December 2018, at 03:04.